Washington Gives National Day of Service in honor of Martin Luther King Jr.
Activity: pruning encroaching vegetation on trails in Hidden Valley and take photographs of the preserves for our digital library. The event is also this Saturday, November 10th from 10 AM - 12 PM in Dover Plains, NY. If you have any questions or if you would like to volunteer, please email Senor Nolan at nolanm@region-12.org, or stop by his classroom. See flier for more information. The SVS Debate Team is looking for student volunteers to direct debaters to rooms, work the registration desk, and help with set-up and clean- up. The event is scheduled from 8 AM - 5:30 PM, however help is needed from 7:45 AM - 6:00 PM. Students are welcome to work for any part of the day. Mrs. Beilinson, the debate coach, can sign off on your Community Service Forms. For more information about volunteering or to sign up, please contact Wilson King at kingw2019@region-12.org. Help with set up of haunted stage, decorating of Primary School gym, fun activities for the children, face painting, etc., pumpkin carving and cleanup. Volunteers needed to check in Roxbury residents at the Household Hazardous Waste Day. We need a representative from Roxbury to check residency as people come in. We can split the shift or if someone would like to work the entire shift. Friday, Sept 21 - Will need 3-4 people (3-6) to help set up in Bryan Hall. Chairs, tables etc. Saturday, Sept 22 - Will need 3-4 people from (4-9) to help with actual auction…fetch art for auctioneer, generally be available for any necessary small jobs. Sunday, Sept 23 - Will need 3 people from (10-1) to help restack chairs etc. and return unsold artwork to artists. Volunteers should wear khaki pants/skirts and white shirts/blouses. The Roxbury Conservation Commission is putting together a trail work group. We need 4 to 6 able-bodied students to perform maintenance and trail-construction work on Joey's Trail. Duties would include cutting back undergrowth, moving brush piles, and hauling mulch with wheelbarrows. Dates and times will be various --after school and on weekends depending on availability and weather conditions. Work for an afternoon or several days and get your service hours completed! Refreshments included. Call or write to day to get on our email list. Steep Rock Association is doing a snapshot survey of visitors to the preserves on Saturday, April 29. Volunteers will sit at a table at the entrance to preserve encouraging visitors to fill out paper survey. Grab a friend and help SRA. Chocolate Fest - Help is needed with setting up tables, helping customers filling their plates with chocolate goodies and help with clean up. Students can work as many hours they like. Volunteers needed for the Roxbury Congregational Church Christmas Fair. Sell baked goods and craft items; cashier for café; bring guests food orders; pack up tables and chairs at fair end. Text 203-947-1098 for more information. On Sept. 30, The Friends of Burnham Library would like help with their set-up for the book sale. Help is needed in moving books from the library to outside. On October 2 they would like help with clean-up. Packing up books and bring them into the library. Roxbury Conservation Commission is holding another work day to build Joey's Trail. Volunteers will work to clear new undergrowth and remove additional brush along the trail route and spread a layer of mulch. The conservation commission is recruiting an additional work team of volunteers experienced in construction to build and place 150 feet of boardwalk to pass over wetlands and watercourses. Farm Revival Dinner for 200 guests. We need students to help park cars and help people with hay rides. Date/Time: 10/1/2016, 3:30 a.m. - 12:30 p.m. The Roxbury Conservation Commission needs volunteers to work on June 4, 2016. We are building Joey’s Trail, a 1/3 mile loop trail connecting the Roxbury Senior Center, Booth Free School, and Minor Memorial Library. Designed as a memorial for 11-year-old Joey Awlasewicz, a Roxbury resident and former Booth Free School student, the trail will serve students, seniors, and residents. Volunteers will gather at 8:30 AM on June 4 in the back parking lot of Minor Memorial Library, 23 South Street, Roxbury. Volunteers on June 4 will work to clear brush and undergrowth along the planned trail route. Additional work days will be scheduled to construct 150 feet of boardwalk. The trail loop will pass over open fields and through woodlands and wetlands. We ask volunteers to arrive ready and able to work with proper clothing, gloves, and footwear. If you have them, please bring brush clearing tools, shovels, wheel barrows, and rakes. Refreshments will be served. Students are needed on one Saturday per month from Jan. till May to help with STEM-related programs for primary school children. Date/Time: 11:30 a.m. - 12:30 p.m. The SVS PTO need 1 to 2 students to help run the concession stand at the home basketball games. We sell pizza, water, and snacks. The students should arrive around 6:30 and stay through half-time in the varsity game and when the pizza is sold out. Christine Johnson is the contact person for the girls' basketball games and Linda Schneider is the contact for the boys' games. Games are mostly on Tuesday and Friday evenings. The students would be working with a parent volunteer. The first home game is Dec. 15. Mrs. Collette Wynn would like some help moving her heavy planters. This can be done after school or the weekend, but before the frost comes. 1-2 students. Please call her at 860-868-6804 and arrange a time to help. Volunteers needed for the Roxbury Congregational Church Christmas Fair. Sell baked goods and craft items; cashier for café; bring guests food orders; pack up tables and chairs at fair end. Text 203 9471098 for more information. Volunteers needed for the Roxbury Congregational Church Christmas Fair. Set up tables and items for sale prior to Christmas Fair. Text 203 9471098 for more information. 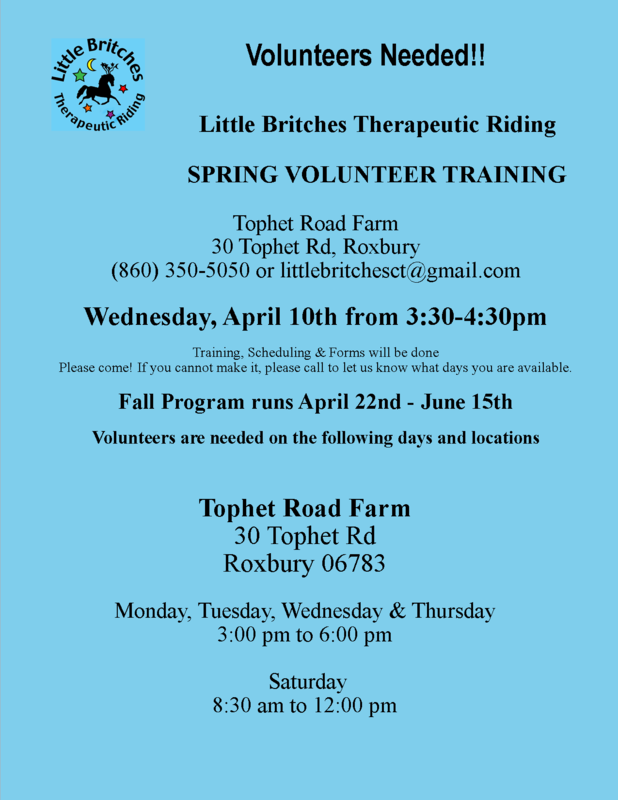 Little Britches Therapeutic Riding is requesting volunteers for its annual 5k walk/run. Volunteers are needed to assist in a variety of ways including registration and check-in, water station, directing runners/walkers on the course etc. Volunteers needed for to serve appetizers at the Senior Center Winter Festival in Roxbury. Selling food concessions at boys and girls basketball games. Setting up and cleaning up concessions. Dates needed: 12/10, 12/16, 12/19, 12/23, 1/2, 1/6, 1/9, 1/13, 1/16, 1/20, 1/23, 1/27, 2/3, 2/10, 2/17, 2/20 , 2/25. Volunteers needed for the Danbury Land Trust event. Need kids to help guide guests from the car park and along the pathway to the tent where the event will be held. Food will be given to the volunteers! Orange vests will also be supplied for the evening. We are assembling small groups of volunteers to gather water samples and assess the macroinvertebrate (aquatic insect) population at several locations on the Shepaug River and its tributaries. After a training session at town hall, participants will travel in teams to sampling sites. After the collection, everyone will return to town hall where specimens will be processed. This is a unique chance to participate in citizen science and learn more about the most prominent (and most important) geographical feature of the Region 12 area. Samples are sent to the Connecticut Department of Energy & Environmental Protection for further evaluation and as an enduring record of the health of the Shepaug River. Waders and nets will be supplied. Wear appropriate outdoor clothing. Snacks and lunch will be provided. The time commitment is 9 AM to approximately 1:30 PM. This is a terrific, hands-on service learning opportunity for high school students, scouts, anglers, hikers, or any other individuals or groups interested in the protection of our local rivers and watershed. Volunteer participants will be directly involved in the critical role of monitoring the health of our area rivers. Please contact Trudy Swenson for further details and enrollment. Please provide an email address and phone number for contact in case of cancellation or postponement.